For about an hour I had been standing waist deep on the edge of a vast expanse of inter-tidal shallow water flats casting my fly across the deepwater channel that snaked its way in from the ocean that lay beyond the sand dunes behind us. Steadily the water depth had increased with the flooding tide and Jack Wishart, my companion and guide, was confident it would not be long before our efforts would be rewarded. The striped bass we were targeting, Jack had informed me, would start to enter the inter-tidal lagoon with the flooding tide using the channel as a highway, before spilling out to feed on the smorgasbord of rich pickings they knew they would find amidst the numerous creeks and salt marsh’s that are a feature so typical of much of the famous Cape Cod peninsula. It was my fly that got hit first, and instinctively I reacted in precisely the way Jack had advised me not to. “When you get a pull,” he had earlier warned, “just keep stripping the fly back until everything locks solid. 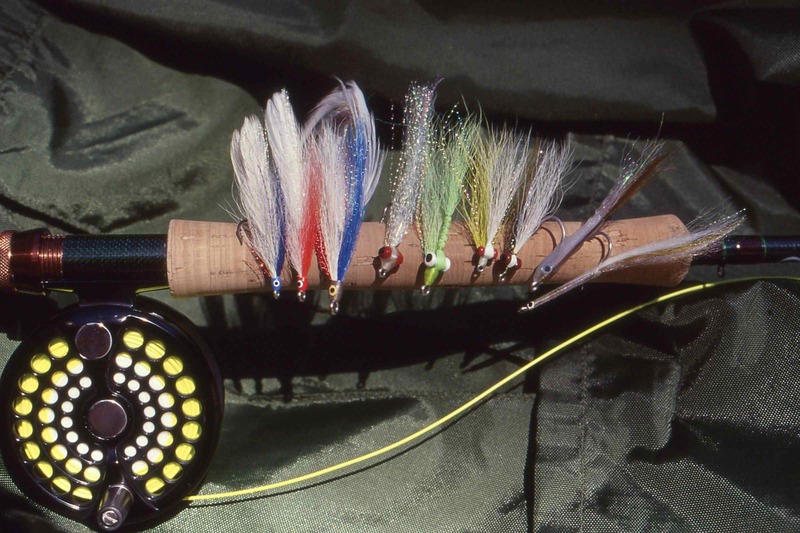 If you attempt to strike with the rod as you would when trout fishing, almost certainly you will miss the fish.” Undoubtedly sound advice from a guy who has fished these waters for many years yet, when my fly was suddenly stopped dead in it’s tracks instinct had taken over and I had struck, and missed the fish. As if to emphasise my incompetence, even before I had had time to re-cast Jack’s rod was bent in visual confirmation of a hooked fish. Jack playing a nice striper in the lagoon just south of Chatham, Cape Cod. As Jack had predicted the fish had indeed moved in with the tide. Now the water in front of us was now alive with activity as striped bass along with an occasional bluefish, swirled and boiled in pursuit of the densely packed shoals of small baitfish that were being swept helplessly along in the swift flow of water. A few casts later I detected the faintest of plucks as I worked my fly back towards me, followed a split second later by a hefty tug. This time I resisted the urge to lift the rod, encouraged by Jack who had noticed the take and was now hissing, “strip, strip, strip” into my left ear. I kept my composure and kept stripping and for a few moments I thought the fish had rejected the fly, then everything suddenly went solid. Feeling the weight of the rod the fish surged out towards deeper water and the stripping basket at my waist emptied quickly as the line hissed out through the rod rings as hooked fish swam towards deeper water. 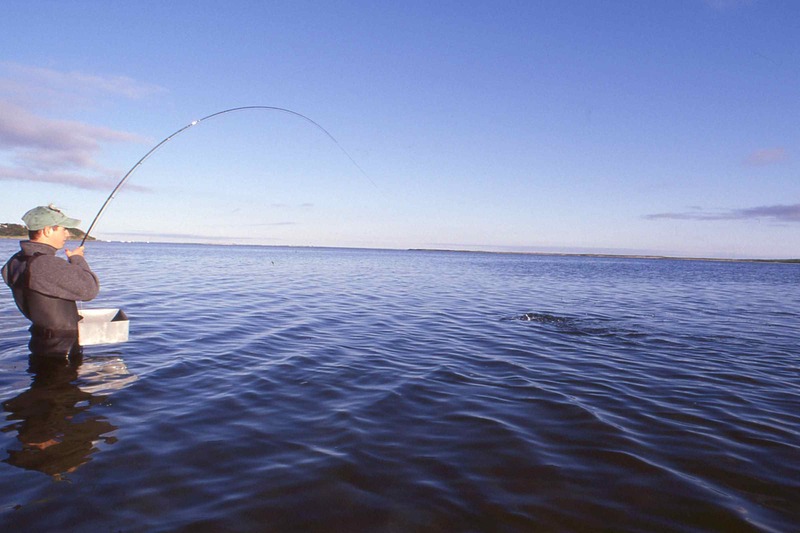 Only then did I lift the rod, which instantly assumed the satisfying bend of a hooked fish and five minutes later I slipped the barbless hook out of the jaw of my first fly caught striped bass; a chunky, ocean bright five pounder. Jack and I caught several more striped bass that evening, before darkness and an excessive depth of water forced us to reel in and beat our retreat back through the dunes to the beach car park in front of Chatham’s historic lighthouse. But we were back at the very crack of dawn the following morning, as we were the next evening and the morning after that for I, like many thousands of others who flock to fish America’s east coast beaches, had now become a confirmed striper-on-the-fly-adict. Previously to that first evening with Jack I’d caught striped bass before, including several up to 20lb or more in weight, but none of these had offered the level of sport I had now discovered with my fly rod. The Cape Cod peninsula is to Massachusetts what The Keys are to Florida- the salt water fishing capital of the state. Fishing hereabouts is big business and in some areas it seems that every other shop sells tackle and bait, and that one car in ten is either towing a fishing boat or has rods strapped to the roof. Fishing is certainly a major past time on The Cape, which is hardly surprising as these days the fishing is so unbelievably good, but things haven’t always been so. 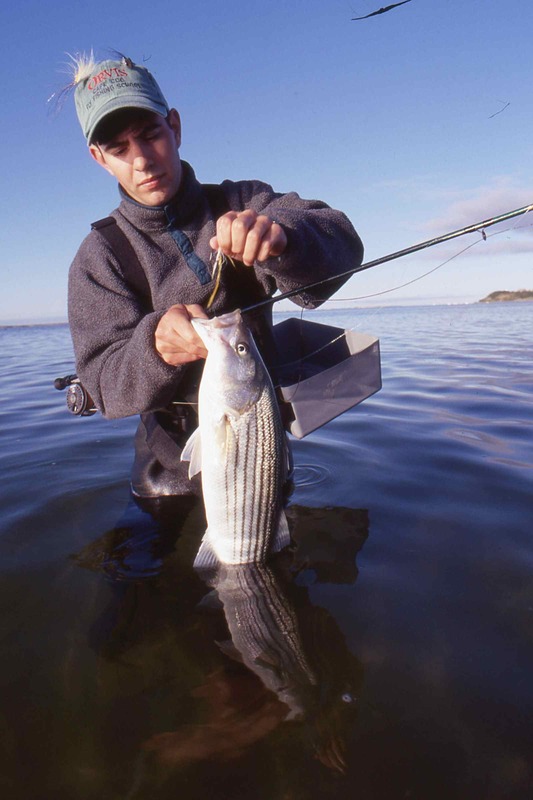 The striped bass is one of the sport fishing world’s great success stories. 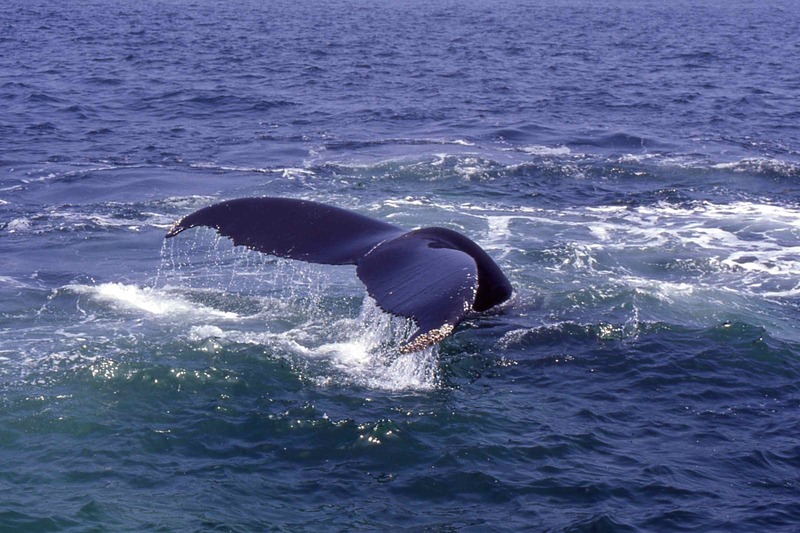 Once forced by excessive commercial pressure to the very brink of extinction, in the early 1980’s the species were protected by a moratorium covering both commercial and sports fishing. These drastic measures worked well, exceedingly well, and by the end of the decade numbers were well on the increase. Strict controls covering both catch and size limits with both a minimum and a maximum size, has ensured that today’s anglers can enjoy one of the finest rod and line sports fisheries in the world, with abundant numbers of fish throughout the stripers range. 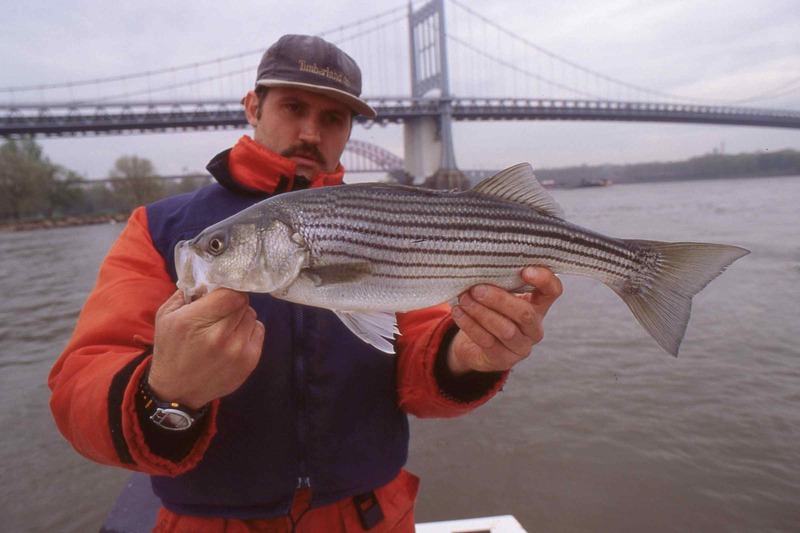 The majority of mature striped bass over winter in the Chesapeake Bay area in Maryland, before beginning their annual northerly migration with the arrival of spring. 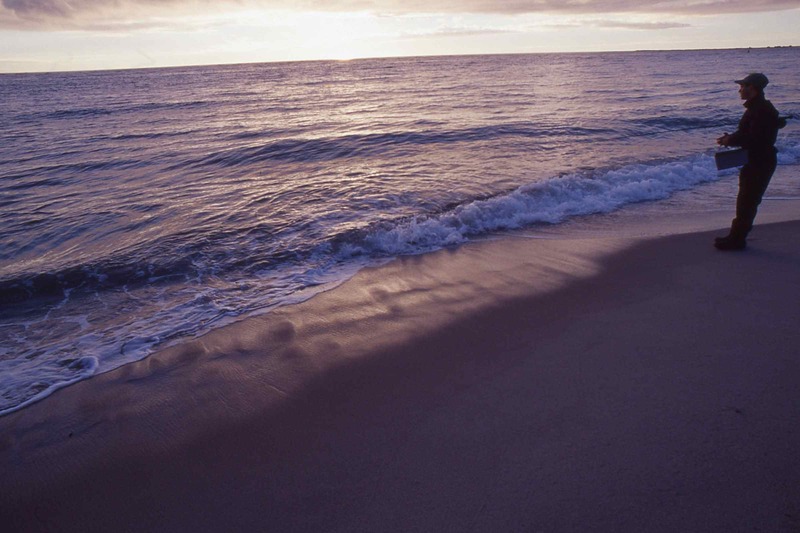 The fish arrive off the coast of New Jersey and New York in April, before spilling into Long Island Sound and on northwards to Connecticut and Massachusetts where they will be well established May. 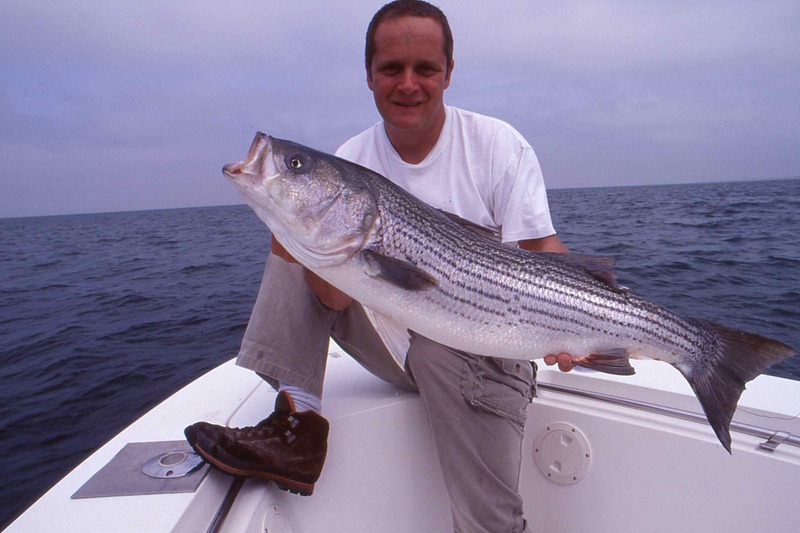 Now sport at world famous striper fisheries such as Nantucket Island, Martha’s Vineyard and Cape Cod will be in full swing, and this is the time when many of the biggest fish, which are affectionately referred to as ‘cows’, and which frequently exceed 30lb or more in weight, put in an appearance. By mid-summer bass will be present off the coasts of New Hampshire and Maine, which marks the most northerly point of their seasonal distribution. Then, come September, they begin to work their way southwards, and for many this is the ultimate time to fish as huge shoals of migrating striped bass gorge themselves on baitfish in a frantic attempt at piling on layers of fat to see them through the winter. 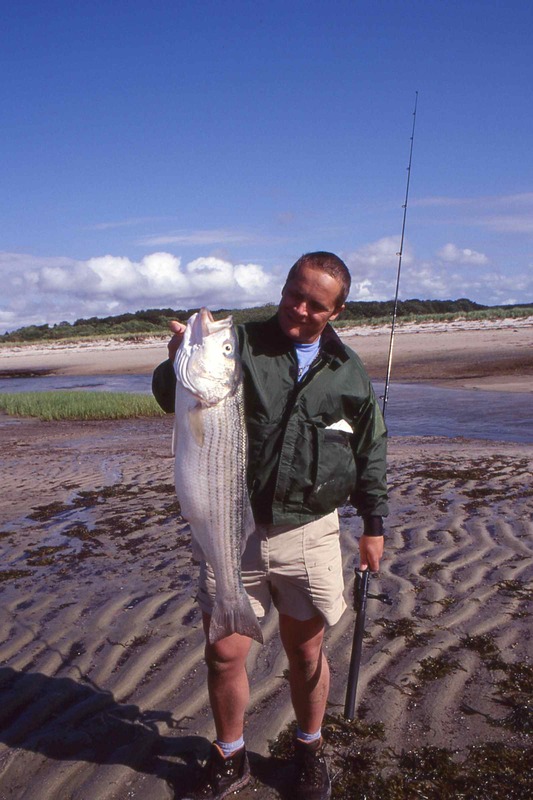 During ‘The Fall Run’, the entire area of cost ranging from Boston down to New York including Cape Cod and Montauk hosts an invasion of striper anglers, many of whom have discarded they traditional beach casters and spinning rods in favour of a fly rod. During the first few days of the trip when first I met Jack, I had spent several hours early each morning exploring the endless miles of coastline with my spinning rod. Each morning I’d be up and on the beach fishing in time to see the sun rise, it was nothing for me to walk three or four miles along some of the most glorious surf beaches I have ever fished, or perhaps explore inland around the labyrinth of tidal creeks and lagoons which surround Chatham. Most days saw me release a fish or two, but by and large these were ‘schoolies’-bass less than 10lb in weight. One morning my light spinner was stopped dead in its tracks, the rod bent and the clutch on my reel screamed as many yards on line were ripped free by the bolting fish. That morning a moderate surf was pounding the beach, and for fifteen minutes the fish used the powerful back tow from each rolling breaker to its fullest advantage, testing both my nerve and the 10lbBS line I was using to their absolute maximum. By now I was wading deep in the cold water, but my desire to land that fish overcame the numbing cold. Eventually I brought the fish to hand and managed to secure a grip under the fishes gill cover, then wade ashore with my prize-a superb fish which later tipped the scales a tad under 12lb. Another day I had chartered a boat for a days fishing out of Rock Harbour in Cape Cod Bay to fish the productive flats off Brewster. Here rarely did we fish in depths greater than 12ft, and as we slowly drifted across the bay every detail beneath us was clearly visible. Often we could see striped bass following the shallow diving plugs we had cast towards the occasional, isolated patches of grass and rock we were drifting over. I caught plenty of stripers, but for me the crowning glory was a heft fish that had slammed into my jointed plug as if it were the first food it had seen in weeks. That fish gave me a memorable fight and from the outset I could see it was easily the biggest striped bass I had ever hooked. And so it was, a huge great slab of a beast which several hours later registered almost exactly 19lb back at the tackle shop-not quite a cow! Not quite ‘a cow’ but I’m not complaining! A year later I was back on the east coast of The States, and again striped bass were very much on the agenda. This time I would not be fishing amidst the solitude of Cape Cod, rather I’d be fishing at one of the most frenetic cities in the world; NYC. NYC, if you’ve never been, go! I first visited in 1977 on a ship, and have been back many times sine; I love the place! With a loud screech of tyres on wet tarmac, the bright yellow taxi quickly disappeared back up an almost deserted side street and joined the heavy throb of morning traffic. Somewhere in the distance the manic wail of a police car rose loudly above the symphony of car horns being sounded by the countless thousands of impatient drivers who were frustrated at being stuck in the barely moving jam. Had it not been 9 ‘O’ clock in the morning I dare say I would also have been a touch concerned, a deserted dockside street on the lower east side is not the ideal place to wander around on your own with couple of thousand pounds worth of camera gear hanging temptingly over your shoulder. 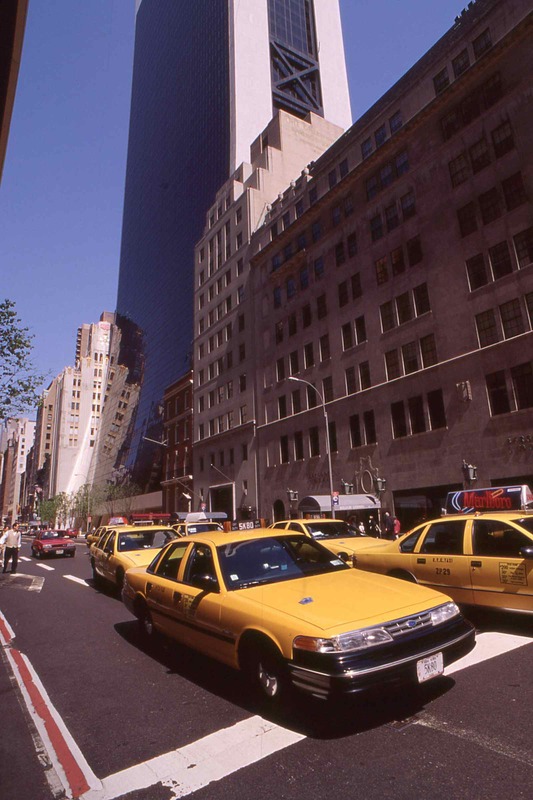 NYC yellow cabs. These guys see all sorts, but not too many fishermen! 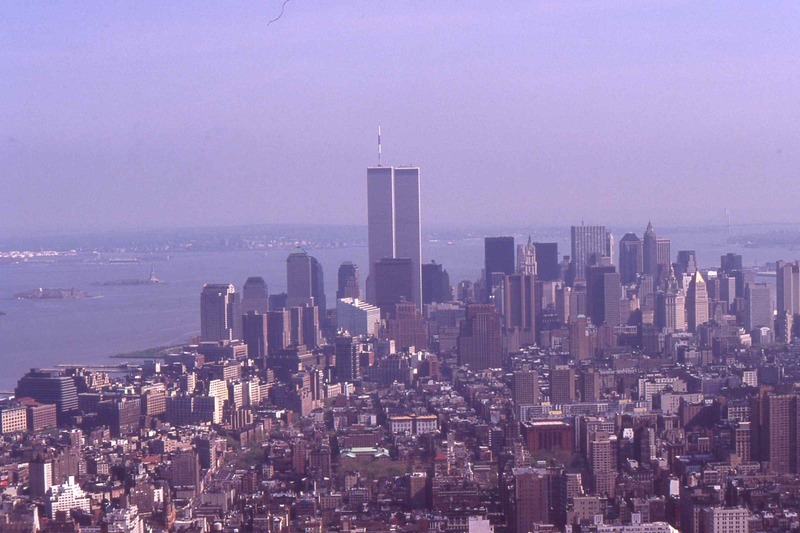 I had been dropped at the New York Manhattan Skyport on east 23rd street, on the banks of the East River, a small marina consisting of just a single inlet maybe a couple of hundred yards long with space for a couple of dozen sizable boats. There is a seaplane terminal at the end, and if I looked upwards I could just make out the tip of the Empire State building standing tall and proud above the solid line of sky scrapers which towered above me. The trip had actually started a few months earlier, on my previous trip to Cape Cod on Cape Cod. I had picked up an American fishing magazine that had a feature in it on fishing for stripers in New York. Immediately I was captivated at the idea of catching bass under the Manhattan Skyline or in the shadow of the Statue of Liberty. 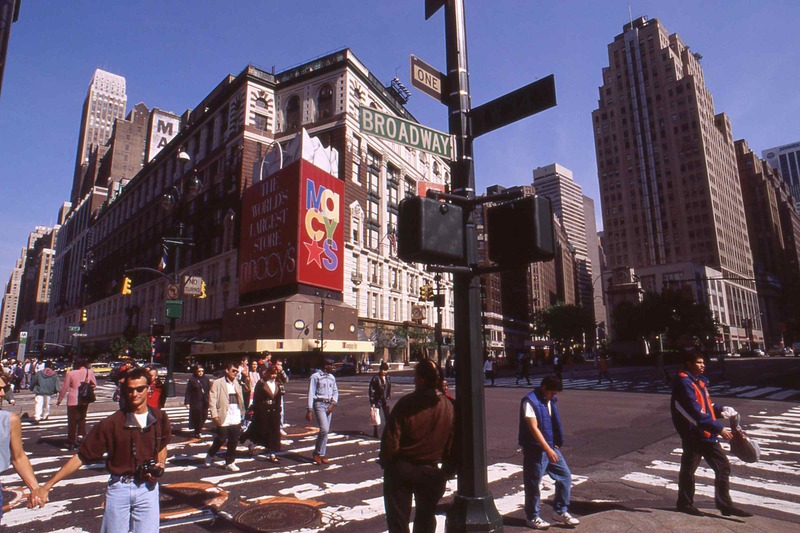 I followed up the contacts at the end of the article, and before I knew it I was standing on 5th Avenue trying to hail a cab. It takes a lot to turn heads in New York City, these people have seen it all, but someone dressed for a days fishing holding a fishing rod; that will do it. I was booked for a day with Capt Joe Shastay, a professional guide who takes anglers fishing all around Manhattan Island. 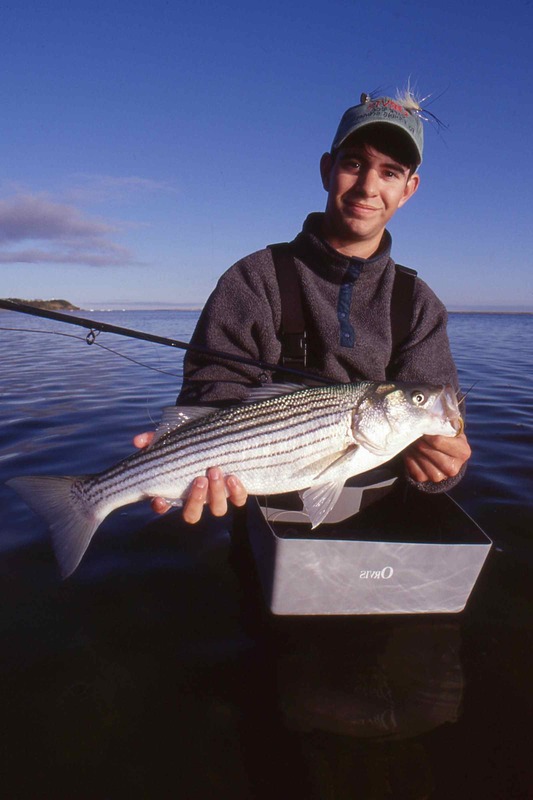 Joe lives in New Jersey and he specialises in striped bass and bluefish. Most of his regular clients, he had told me, were invariably office bound ‘nine till fivers’, who needed a regular ‘angling fix’ after work or at weekends. Soon after Joe sailed into the marina in his 18ft American built Mako sports boat, and after the briefest of greetings I was hanging on to my cap as we roared north, passing Roosevelt Island as we headed towards our first mark, a tide rip known as Hell’s Gate between Harlem and the South Bronx. It had been raining for most of the morning, but thankfully the downpour had stopped by the time we started fishing.We had anchored in about 20ft of coloured water, and were both fishing with light spinning outfits rigged with floating plugs. The technique was to cast down and across the tide, then allow the strong current to sweep the plug around in an arc until it was astern of the boat, then with a slow retrieve and an occasional twitch, wind the plug back. Bet this guy does not suspect there’s good sport fishing almost within casting range of where he is walking! We had been fishing for no more than ten minutes when Joe caught the first bass. On light tackle the fish fought well, but was soon brought alongside, netted, photographed and, with a flick of it’s tail returned. For the next half an hour we fished for no result, then Joe decided to try further up river, near New York’s La Guardia Airport. Mark number two was almost ‘rural’ in appearance, though the solid line of sky scrapers were always visible, along with the constant wail of sirens. Now we were fishing in less than 6ft of water, and Joe had swapped the plugs for white rubber worms and jigs. First cast and I had barely started to retrieve when a fish grabbed my lure stopping it dead in it’s tracks. About 20 yards away the surface boiled as a good bass felt the hooks and resistance of the rod. This was the moment I had been planning for months, another chance to do battle with one of the most beautiful fish I have ever had the pleasure to catch, while sitting in the shadow of the New York skyline. When I finally landed it, it weighed a little under 10lb. During the next hour we hooked and landed another half a dozen bass, but by now the rain had returned and was getting heavier by the minute building into a downpour of almost tropical proportions. So what do you do when you find yourself getting soaking wet in an open boat? Well it’s quite simple really, go find a nice wide bridge and fish beneath it. 20 minutes later we parked up under the Brooklyn Bridge. Now not only could I see the sky scrapers and hear the hum drum of traffic, I could smell the fantastic aroma’s emitting from countless food stores and delis, and at time hear the shouts of people on the shore with he bridge above serving as a perfect rain break. This was what I had expected, and I was not disappointed. With about an hours fishing left, I had one final ambition to satisfy; I wanted to fish in front of the Statue of Liberty. I could tell that Joe was not too impressed at leaving the sanctuary and shelter afforded us by Brooklyn Bridge, but reluctantly he agreed and soon we were heading down towards the southern tip of Manhattan and across the bay towards Liberty standing tall and proud in the distance. The rain was all but unbearable by now, but I had this crazy notion to satisfy and I promised Joe I would not want too long. To be honest even the rain, which now was starting to run down my back in an icy trickle, could not have dampened my enthusiasm. 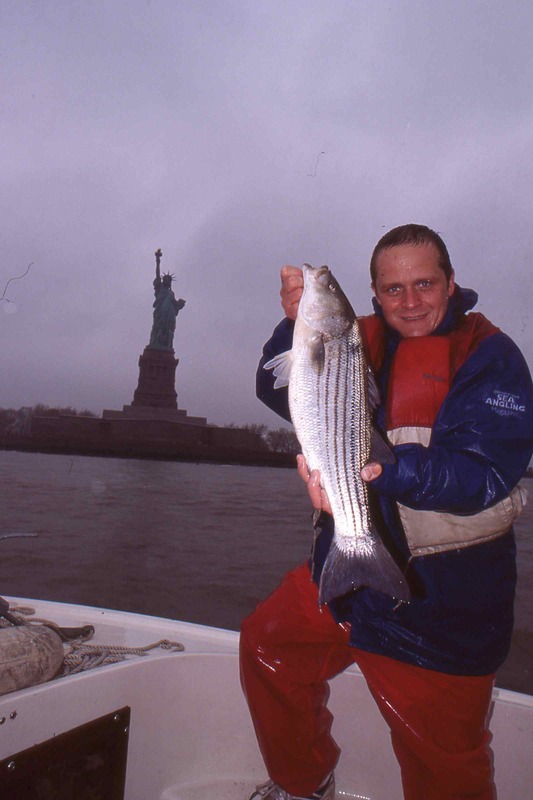 We were fishing about three hundred yards away from the Statue, drifting steadily northwards into the Hudson River. Persistently I cast and retrieved my lure willing a fish to grab it while all the time the rain hammered us. I was all but ready to give up when I hooked a good fish, and immediately the rain was forgotten. Steadily I played my fish towards Joe’s waiting landing net, always under the watchful eye of Liberty, and few minutes later I landed the best striped bass of the day, a fish of about 12lb which easily made it into double figures. 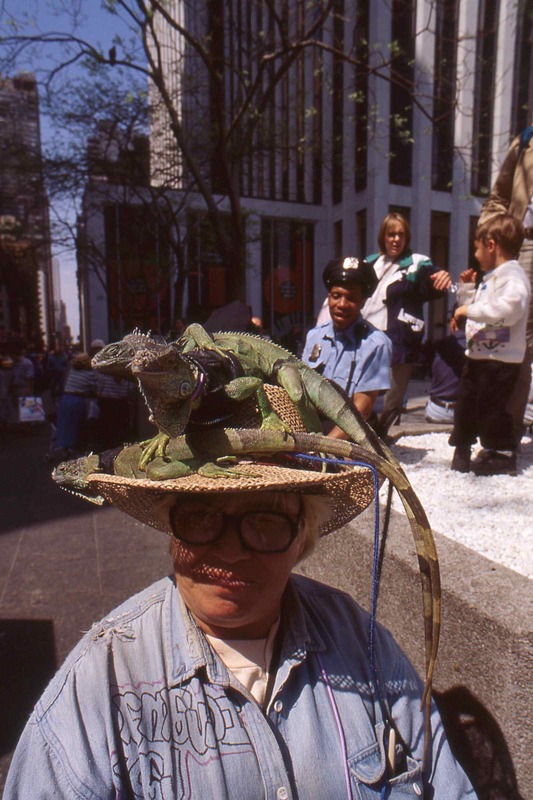 Little old lady with a hat full of live iguana’s, only in NYC! An hour later I was sitting dripping wet in the back of another yellow cab, the driver desperately trying to work it’s way back up Madison Avenue towards my hotel on 54th. “Where you been fishing”, the driver enquired in a thick Brooklyn accent, New York cabbies get to meet a lot of strange people? “On the East River”, I had replied. He thought quietly to himself for a few moments then asked, “You catch anything”? “Over a dozen stripers”, I proudly informed him, “best fish weighed about 12lb”. “Jeeze, I thought the only things that swam in that river were stiffs and turds”, he replied. So do most New Yorkers I thought”, and as long as it stays that way there will always be good bassing in the Big Apple! Remember fishing the North Shore of Massachusetts in Cape Ann back in the day with your friend Sam Webb and Dougie Russell. Seems you’ve done some fishing since and as well have I. It is I Dougie reaching out from the past. My best trip for stripers last summer livelining Boston mackerel was 18 fish ALL over 40″ and in the 30# range. I’ve had days where we’ve caught more fish, but never so many so large. I have outfitted my arsenal of rods and reels to attempt to subdue some bluefin tuna this summer and next fall when the action really heats up. Hope you are well.